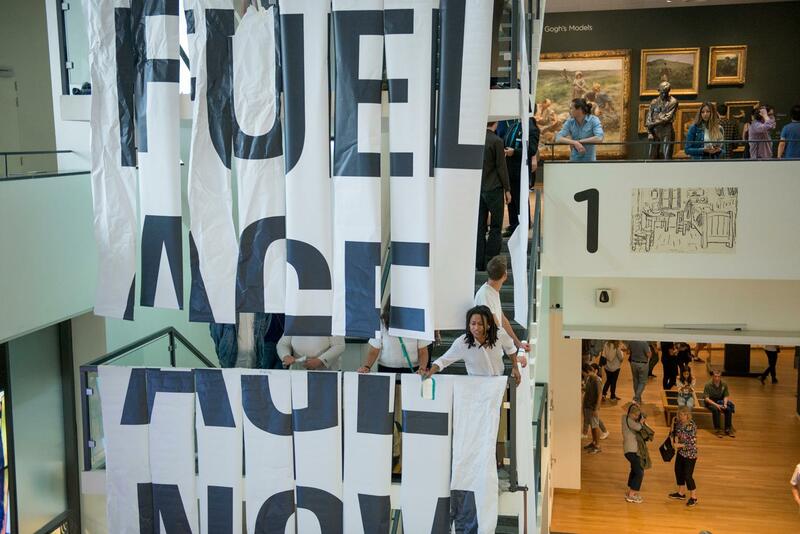 Around 14:00 (9.6.18), one of the 35 Fossil Free Culture Netherlands performers positioned herself on the monumental staircase of the Van Gogh Museum's main building in Amsterdam, ready to declaim the collective’s newly penned manifesto. As her words rang out, others unfurled long paper banners from the balustrades one by one. Only after the declamation was complete, was the full text legible: END THE FOSSIL FUEL AGE NOW. The typographic work of artists such as Barbara Kruger and Jenny Holzer inspired the presentation of the manifesto. Fossil Free Culture NL artists used a 'banner drop' technique to reveal the installation.